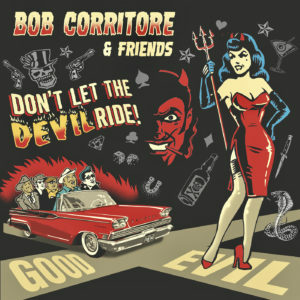 Harp ace Bob Corritore & friends blow through the crossroads with Don’t Let the Devil Ride! We’ve talked here before about some of the terrific collaborations of which harmonica master Bob Corritore has been a part over the years, including recordings with the likes of piano great Henry Gray, guitarist John Primer, and Chicago bluesman Tail Dragger, just to note a few, and Corritore’s new album Don’t Let the Devil Ride! (VizzTone Label Group/Southwest Musical Arts Foundation) is another perfect example of that, featuring a dozen songs captured during nine different sessions between 2014 and 2017. While the title of the project makes it clear that ol’ Beelzebub wasn’t welcome to the party, Corritore does bring a whole bunch of talented friends along for this devilishly good ride down the blues highway, including Gray and Tail Dragger, as well as guitarist Big Jon Atkinson, bassist Bob Stroger, and vocalists such as Sugaray Rayford, Willie Buck, Oscar Wilson, and Alabama Mike, among others. We could easily go through this album for you track by track, but the truth is that 1) absolutely everything here is solid and 2) doing that will really only delay you from going out to get a copy, which is something you’re definitely going to want to do. If, however, you’re looking for suggestions on a track or two (or four) on which to start, we might recommend the uptempo “Tell Me Mama” (Little Walter) that features Oscar Wilson on vocals, Jimi “Primetime” Smith and Johnny Rapp on guitar, and Henry Gray on piano; a creeping “Laundromat Blues” that combines high, raspy vocals from Alabama Mike with some haunting harmonica from Corritore, guitar from Big Jon Atkinson, and piano from Bob Welch to make for a tune that’s so gritty, you might really actually need a laundromat; a shuffling “Steal Your Joy” with booming vocals from Sugaray Rayford, guitar from Chris James and Mojo Mark, and bass from Patrick Rynn; and the funky grooves of “Blues Why You Worry Me?” with its screechy Hill Country style vocals from Alabama Mike as well as guitar from Atkinson and Danny Michel. With its rotating cast of vocalists and musicians, Don’t Let the Devil Ride! once again demonstrates that, for Corritore, playing isn’t about promoting himself so much as it is about the music that’s created, with just as many, if not more, solos on guitar and piano as you’ll hear from Corritore’s harmonica. Together, it makes for a, well, hell of a ride, one that should be an automatic lock for the traditional blues album nomination in next year’s music awards. Here’s hoping there’s some room in that car for an awards statue or two! This entry was posted in Albums and tagged Alabama Mike, Big Jon Atkinson, Bob Corritore, Bob Stroger, Bob Welch, Chris James, Henry Gray, Oscar Wilson, Patrick Rynn, Sugaray Rayford, Tail Dragger, Willie Buck. Bookmark the permalink.